A total of 78 MPs supported the motion while 122 voted against it. Twenty-six MPs were not present at the time the vote was taken. The Prime Minister pointed out that the No-Confidence Motion was fought not to protect an individual but to protect the Government and to protect the victory of the people. Although both the JO and the UNP had claimed that victory was assured for the respective parties, uncertainty prevailed throughout the last two weeks and even after the debate on the motion commenced at 10.00 last morning. This is despite the President giving an assurance on Tuesday night that he would not rock the boat. He had told a group of MPs that he wanted the Government to continue. However, on Tuesday morning the SLFP had requested Wickremesinghe to step down as Prime Minister so that the Government could move on. The UNP ministers had told Minister Nimal Siripala that the SLFP had no right to ask the Prime Minister to step down. However, the President’s sudden move on Tuesday night to abstain, forced several of the SLFP Ministers on the fence to reconsider their decision. 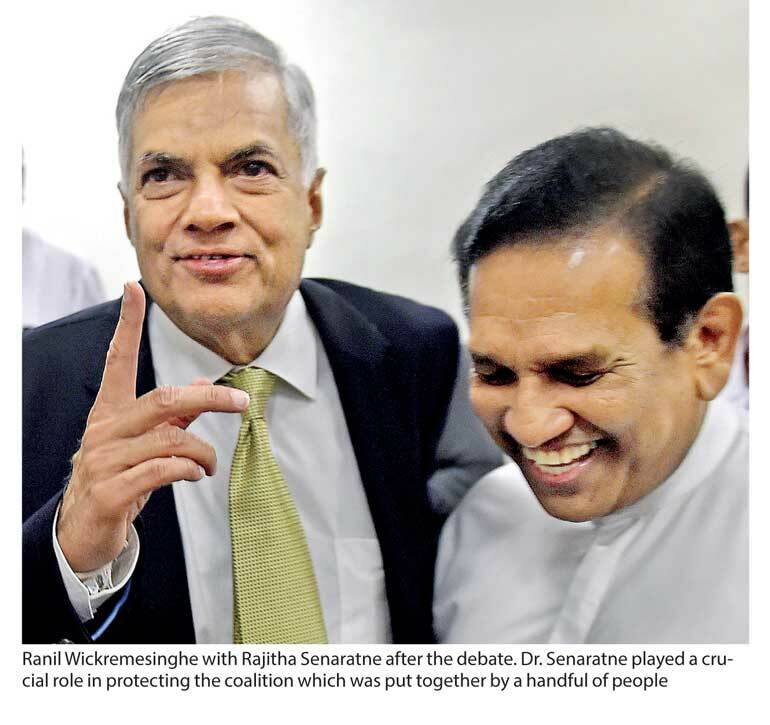 Analysts say that when the Tamil National Alliance position became clear that they would support the Prime Minister, the President and those SLFP MPs who wanted the Government to continue opted to stay away from voting for the motion. On Wednesday morning when the outcome became apparent Palitha Range Bandara and Vasantha Senanayake of the UNP who had declared that they would vote for it at the start and Wijeyadasa Rajapakshe (who was not happy with the party leadership) were also left with no option other than to vote against the motion or to stay away at the time of the voting. On the other hand, the JVP, one of the most vocal supporters of the Yahapalana movement, finally broke ranks by voting with the Joint Opposition. SLFP ministers who were strong advocates of the motion like Lakshman Yapa Abeywardena, S.B. Dissanayake, Dayasiri Jayasekera, Thilanga Sumathipala, Anura Priyadarshana, Susil Premajayantha and Susantha Punchinilame voted for the motion and now are very likely to be booted out of the Government. The current political crisis was largely triggered after the defeat of the UNP and the President’s SLFP faction at the Local Government polls resulting in a blame game on the two sides and Prime Minister becoming the main target for the SLFP critics. President Sirisena also contributed to the crisis by criticising the Prime Minister’s handling of the economy. Prime Minister Wickremesinghe after the victory expressed his gratitude to all the parliamentarians who helped to defeat the motion of No-Confidence which was brought against him and the Government. He went on to say that the Government has a duty to fulfill the responsibilities expected by the country on 8 January 2015. Therefore we now have to start a new journey. The PM added that the United National Party (UNP) also needed to undergo a complete change and that they needed to bring new teams forward. The United National Front needed to be strengthened, he said, adding that they would look to win the support of the majority of the country and move forward. Prime Minister Wickremesinghe now has his task cut out. Firstly, he needs to win the confidence of the public. And secondly, he has to heal the cracks in the coalition. The Government position has been weakened by the rift at the highest levels of the current ruling coalition between the UNP and the SLFP. President Sirisena stripped Wickremesinghe unfairly of two key financial institutions from his command including the Central Bank and the Securities and Exchange Commission. Party reforms for Wickremesinghe are also now a must. He has been the leader of the UNP for 24 years and is today the longest serving leader in the history of the party. He therefore needs to re-energise the party by injecting new blood into its veins and cleaning up his administration by getting rid of all the non-performing and corrupt bureaucrats and giving key portfolios to parliamentarians based only on their capabilities. Going forward many are now urging Wickremesinghe to break free from President Sirisena and the Sri Lanka Freedom Party (SLFP) so that the UNP has the freedom to implement its economic policies. 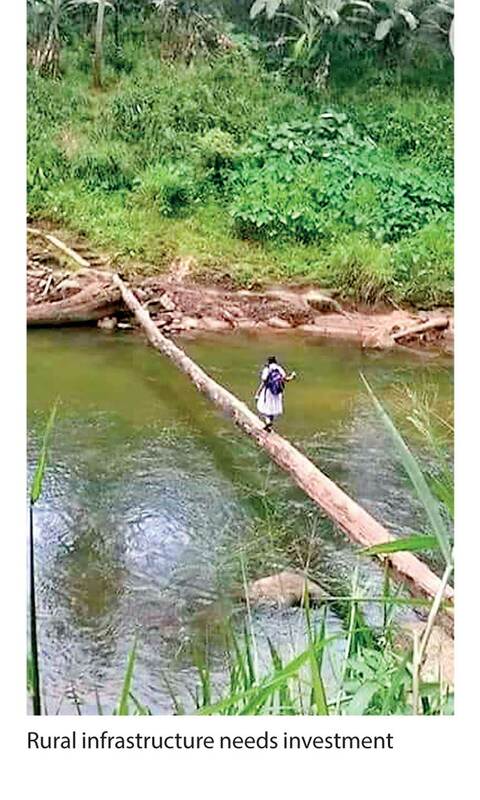 However, a better option in order to protect the 8 January mandate would be to get the President to give the UNP power to implement a transparent economic program unfettered so that they both have an opportunity to go before the people with a less cluttered and confusing track-record. The new tax structure implemented on the 1 April also needs to be revisited and deferred where possible. Taxes that hurt the poor needs to be revisited immediately. Many ministers in the current Government don’t really know what is going on in the villages. Rural infrastructure needs urgent repair in many districts, especially after two disasters last year. Therefore the Government certainly needs tone down its pro-Western and cosmopolitan outlook if they are win the hearts of the rural poor.